Why digital learning is so important? How Over the Top is transforming the telecom sector? 5G is well on the way to reality, but how will it be used and does the business case stack-up? Specification of 5G is progressing rapidly driven by the 3GPP. Meanwhile, mobile operators and manufacturers are moving fast to make the system a reality. As well as being a technological marvel, 5G is intended to take on an astonishingly wide range of applications well beyond current phone and internet services. Building 5G networks will be expensive and these new applications will need to succeed to pay the bills. It is becoming clear what 5G mobile communication systems will look like. There will be lots of new technology offering new levels of performance and capability. But the really big change is a huge expansion in the applications covered – everything from smart meters to self-driving cars and from augmented reality to emergency services. Of course, it is also a mobile phone system, but that’s only a small part of the story. New mobile generations emerge approximately every 10 years starting with the 1G analogue Nordic Mobile Telephone system in 1984. 2G was the first digital system and provided low cost voice telephony and text messaging. Digital transmission was expanded with 3G starting in 2001, but data rates were limited. Much better data rates came with 4G starting in 2009 leading to the current situation where smartphones dominate and provide telephony and internet services. The situation with 5G is reminiscent of the early days of 3G. 3G offered for the first time a workable data service alongside mobile telephony. But there were only sketchy ideas on how to use this data and to begin with 3G data usage was very low. This was a problem since the business case for 3G depended on making use of mobile data and there was much talk about needing a “killer application”. In the end the smartphone came along and it rapidly became clear mobile internet was the killer application. Rolling out 5G networks will be an expensive business and if the result is merely a better mobile phone and internet service, it will be a financial failure since this will generate insufficient revenue to justify the cost of deployment. So the question is will the hoped for new applications of 5G materialise and will they be sufficient to pay for the technology? This is the questions addressed in this paper. Less than 1ms latency for ultra-reliable low-latency communications (URLLC); the target here is applications such as self-driving cars and factory automation. These features are can be considered to target a triangle of applications as illustrated below. Spectral efficiency and advanced radio – Sophisticated 3D beamforming, massive MIMO and coordinated multi-point access (COMP). Other improvements include new coding methods and better bandwidth occupancy. Spectrum – Spectrum will be in two classes – sub 6GHz as with existing cellular systems and above 6GHz, including extending into millimetre-wave bands. Maximum user bandwidths are extended to 100MHz below 6GHz and 1GHz above 6GHz. Densification – 5G can support much denser networks using small cells. This is particularly important above 6GHz owing to inferior radio propagation. New architectural concepts including separation of control and data planes make this possible. SDN and NFV – Software defied networking and network defined functionality enable functionality to be distributed as required for flexibility and scalability in functions such as IoT. Network slicing – Network slicing down to the physical layer along with lightweight protocols will enable the system to be configured for compact low-cost battery powered terminals along with massive connectivity and good coverage. 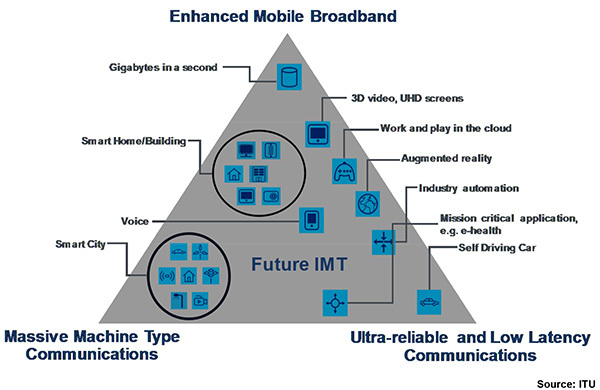 The ITU has set the overall framework for 5G in the form of its IMT2020 specification. This sets out the performance targets and the concept of the triangle of applications domains described above. In earlier mobile generations, systems from multiple sources were submitted to achieve such ITU defined capabilities. Nowadays 3GPP dominates and this process is somewhat of a formality – nobody disputes 3GPP as the creator of 5G. Following early studies, 3GPP announced a two-step process to speed up the specification of 5G. The first step in the form of the Release 15 (non-standalone) specification was completed in December 2017 when an initial 5G New Radio (NR) was finalised – it is non-standalone in the sense of requiring the support of a 4G network. This was followed in June 2018 by Release 15 (Standalone), a full 5G specification including radio and network aspects. Of course, there will be many enhancements in future releases of the specification, but the basic structure of 5G is now defined. One of the requirements to make 5G a reality is the availability of new spectrum. Accordingly, many countries have already awarded new spectrum to their operators or are planning to do so. This includes spectrum in the familiar bands below 6GHz. In addition, some counties have started allocating spectrum above 6GHz, in some cases extending into the millimetre wave band above 30GHz. There are also discussions on unlicensed usage, but specific plans here are vague. Now that 5G is starting to look real, there is intense activity by manufacturers and mobile operators with announcements seemingly on a daily basis about new trials, demonstrations, research labs or network build-outs. Even governments are getting involved with several new initiatives to encourage early deployments. In the end, it is likely 5G will be operational by 2020 and will be reasonably widely available to the public by 2022. Better mobile broadband – Faster speeds and greater density will be available to support applications such as live TV, video streaming and augmented reality. An issue here, as highlighted in a recent survey by Ericsson, is that mobile subscribers are expected to be unwilling to pay for these improvements. Indeed, in a market where prices for mobile broadband are falling, it may be the best that can be achieved is to maintain existing revenues in return for a better service. Internet of Things – This area has been developing steadily for several years and there are very ambitions estimates of the eventual size of the market. There are undoubtedly many and various applications for large numbers of connected devices – smart meters, domestic appliances, asset tracking, etc. But progress to date has been slower than expected. 5G will bring a step-change in the technology available, but will it be enough to make IoT really take off? For one thing there are competing technologies such as LoRa and Zigbee. An effective way of delivering these applications is also needed since Cisco report that some 75% of IoT projects fail at present. Mission-critical systems – Applications here include self-driving cars, mobile health systems, factory automation and emergency services. Low latency is important in many of these applications as is the ability to create in effect a separate network for critical services using network slicing. Emergency services such as police, ambulance and fire services currently use antiquated communication systems are likely to be an early beneficiary of these new capabilities. Fixed wireless access – This could be an early application especially in areas where fixed coverage is poor owing to delays rolling out fibre to the home. With a realistic data rate of around 100Mbps and high-density operation, 5G could be an alternative to fibre, at least in the short-term. Interestingly, improving coverage is not a major focus for 5G despite the this being a key concern for consumers. For example, a recent study in the UK found that 2% of roads have no mobile coverage and 18% have no data coverage. 5G will be expensive, especially where densification is used in highly populated urban areas. This could mean, for example, 20 sites per square km instead of less than 5 today. This will apply particularly when spectrum above 6GHz is used owing to its inferior propagation. In such cases, network costs could be 5 times higher than with 4G. But, as mentioned above, it is unlikely significantly more revenue will be generated from conventional smart-phone customers. So, the business case for 5G will depend on new revenue streams from services not supported by current generation mobile systems. Although rather unexciting, fixed wireless access could be early revenue earner where fixed broadband speeds are limited in advance of fibre deployment. Indeed, Verizon in the US has announced they will launch 5G in October 2018 in the form of a fixed broadband service, albeit the system will not be fully 5G compliant at the start. There are also undoubtedly new revenues streams to be had from IoT and mission-critical applications. But the timing and extent of these is difficult to predict, especially since it is not known at this time which applications will be successful and how much people will pay for them. not the type of organisation normally known for moving quickly. The difference between 5G and earlier generations is the huge range of applications being targeted. This no longer simply a mobile phone plus internet system, but a system targeting everything from self-driving cars to automated factories and from smart refrigerators to digital healthcare. In this respect, 5G can be regarded as a huge experiment in “technology push”, a term used where a technology is deployed in advance of customer demand. This approach worked out well for Henry Ford who reputedly said if he had asked people what they wanted, they would have said faster horses. But will it work for 5G. Our view is probably yes. But it will require concerted effort to make the new applications work. This will include setting up partnerships and creating new organisations. Even then the successful applications will end up being different to those we now suppose.